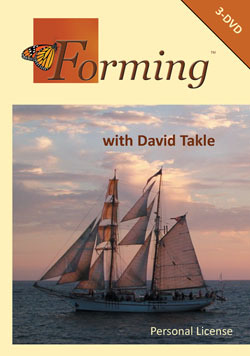 If you are looking for a personal resource that will help you develop an authentic relationship with God � this Personal License version of the 12 lessons taught by David Takle might be for you. You might want to consider purchasing your own Forming Participant Workbook which includes provocative questions and exercises in the workbook that will give you a deepened and recorded journey of the time spent with God. Review and learn the lessons at home. Forming is a fresh, life giving approach to spiritual growth and restoration that is very different from traditional discipleship courses. What makes Forming unique is that instead of relying on willpower and self-effort to bring about change in the participants� lives, they learn how to build a personal relationship with God that changes a person from the inside out. Learning how to be with God, developing a genuine relationship with Him, and engaging with Him for transformation are what Forming is about. Participants learn � how to be formed more and more into the image of Christ, so that the life of Christ flows through them from the inside out. Most Christian�s experience a significant period of growth immediately following their decision to follow Jesus. This growth usually includes new insights, making new friends, changing some behaviors and learning about the Christian lifestyle. A few years down the road; however, most new Christians find themselves in a place where their growth is slowing down and a level of discontent setting in. Some even experience burn-out from over volunteering at church. The reason for stagnation is often associated with self-effort. While there are some things a person can decide to do, such as New Year�s resolution, there are many areas of a person�s heart that cannot change by an act of willpower alone. Trying harder to change only brings more discouragement. Discouragement and disappointment from being stuck can cause people to give up hope of having life-long on-going spiritual growth. A Personal License is for personal use only. Purchasers of this Forming Video Series Personal License may display these images for their personal and private use only. The Personal License does not permit use of the video in groups, classes, training or where the licensee may profit materially or financially from its use.